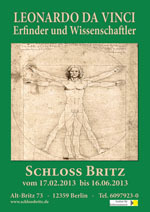 “Leonardo da Vinci – Erfinder und Wissenschaftler” ( The exhibition Leonardo da Vinci – Inventor and Scientist) presents one of the greatest figures of the Renaissance. Not the artistic side of da Vinci is in the foreground, but his brilliant technical knowledge and his scientific ambitions. Since the opening of the exhibition in 2001, almost two million people have seen the it so far. Leonardo’s curiosity and passion led hin to explore and present some of the most important scientific achievements for the human kind. The exhibition gives you a chance to be part of that masterpiece. There is still a month left to check it out.